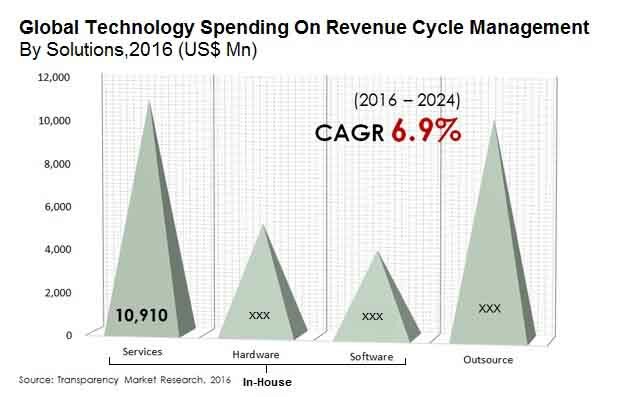 The global market for technology spending on revenue cycle management is characterized by a high level of competition, thanks to the presence of several players operating in it across the globe, states a research report by Transparency Market Research. The leading players in the market are emphasizing on strengthening their distribution channels in order to maintain a dominant position in the next few years. The prominent players, namely Allscripts, McKesson Corporation, Optum Health, Inc., and Cerner Corporation are collectively anticipated to account for a massive share of the global technology spending on revenue cycle management market in the near future. In addition, favorable regulatory framework and the increasing number of players are expected to encourage the growth of the market in the coming years. As per the research study, in 2015, the global market for technology spending on revenue cycle management was worth US$28.50 bn. The market is expected to reach a value of US$51.56 bn by the end of 2024, registering a healthy 6.90% CAGR between 2016 and 2024. From a geographical point of view, North America led the global technology spending on revenue cycle management and is expected to witness a significant growth throughout the forecast period. On the other hand, Asia Pacific is projected to account for a key share of the market and exhibit an 8.50% CAGR between 2016 and 2024. The increasing focus of players operating in Asia Pacific market on research and development activities and new product development is estimated to fuel the growth of the market in the coming years. In addition, the rising awareness regarding the advantages of revenue cycle management is predicted to accelerate the growth of the Asia Pacific technology spending on revenue cycle management market in the forecast period. On the basis of platform, the global market for technology spending on revenue cycle management has been classified into stand-alone and integrated. A stand-alone platform works independently of other software or solutions. This platform does not require patient health records. On the other hand, the integrated platform is a combined system for a single revenue cycle solution. According to the research study, the rising demand for revenue cycle management is expected to fuel the growth of both these segments in the next few years. The increasing number of advantages owing to its implementation is the key factor anticipated to encourage the growth of the global technology spending on revenue cycle management market in the coming years. A substantial rise in revenue generation, easy compliance with industry rules and regulations, and enhanced efficiency in healthcare practices are some of the vital benefits offered by revenue cycle management, which are projected to augment global market in the coming years. Furthermore, the rising competition among the prominent players and the advancements in technology are estimated to accelerate the growth of the technology spending on revenue cycle management in the coming years. The global market for technology spending on revenue cycle management, on the flip side, is estimated to face several challenges throughout the forecast period. The inability of revenue cycle management to handle uninsured patients is anticipated to restrict the growth of the overall market in the near future. In addition, the rising pressure incurred owing to the changes in regulatory framework and the increasing concern related to the security and integrity of data are estimated to hamper the growth of the market in the near future. Nonetheless, the rising use of credit card programs that are offering and covering a massive percentage of population and allow a faster access to medical data are expected to supplement the growth of the market in the near future.